All Things Fall, Massacre of the Innocent. Based on the painting “Massacre of the Innocent” by Rubens, Sebastian Burdon has created a zoetrope of insane detail. The 300 plus figures, and architectural elements were modeled in 3D Studio Max and Z-Brush. They were then printed using a 3D printer to create the final result. 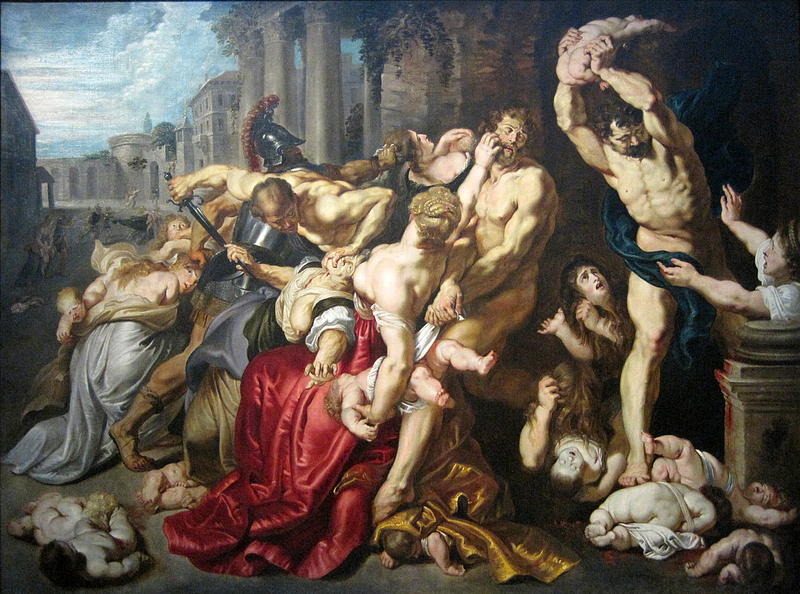 When rotated and illuminated with a strobe light, the scene comes to life with total effect showing the gruesome carnage depicted in the original painting. It took Burdon 6 months to complete the modeling and animation, and frankly based on the level of detail I’m surprised it didn’t take longer. The original painting is below the video. « Le Massacre des Innocents », huile sur bois (Hauteur. 142 cm ; largeur. 182 cm) d’après Pierre Paul Rubens vers 1610-1612, appartenant aux musées royaux des beaux-arts de Belgique de Bruxelles. – Inv. 3639, photographiée lors de l’exposition temporaire « Rubens et son Temps » au musée du Louvre-Lens.